Ladies and gentlemen, you decide. Action-packed may not be the word you would normally use to describe your Spanish studies. But with “Narcos,” it can be. Sit back and learn palabras (words) with Pablo thanks to the popular show. It’s a great way to brush up on your Colombian slang or just see how the Spanish language is used in certain situations. You might even add some vocabulary words to your arsenal that you never would have thought to look up otherwise. No lies here, just learning. “Narcos” is an extremely popular Netflix series. At the time of this writing, the series is in its third season, with the promise of a fourth on the way—which means you’ll have plenty of content to learn from! “Narcos” contains adult language (sometimes offensive), themes and visuals. It’s meant for mature audiences only! Still here? Okay, let’s move on. 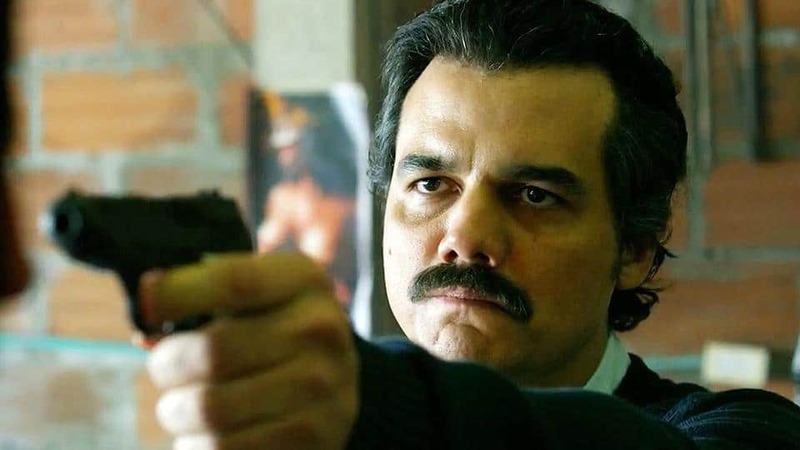 The show is set and filmed in Colombia and centers around the true story of Pablo Escobar, the billionaire drug king who worked with most of the world’s drug trade at some point in time. We follow a young team of Drug Enforcement Administration (DEA) agents as they try to catch the infamous criminal. Throughout the show, we also get to see glimpses into the life and mind of Pablo Escobar. Although the story follows characters all over the country, you’ll learn the most about Medellin, Colombia. This city nestled in the mountains was Escobar’s home and the safest place for him to live his extravagant life of luxury. Personally, I love the show. It’s a good mix of action, danger, and drama. There are power struggles, relationship problems, violent warfare and subtle politics. If you decide to watch the show, then be prepared to get hooked. The story will draw you in and you’ll just have to know what happens next. You can use the fact that you love the plot to spend some extra time learning Spanish. It’s so much easier to motivate yourself to watch “Narcos” than it would be to sit down and work through a textbook. Perfect Sunset School offer Spanish immersion programs and Spanish language school in Costa Rica—You will learn with music videos, movie trailers, —and turns them into personalized language learning lessons. The immersive, entertaining content makes grammar and vocabulary much more memorable. 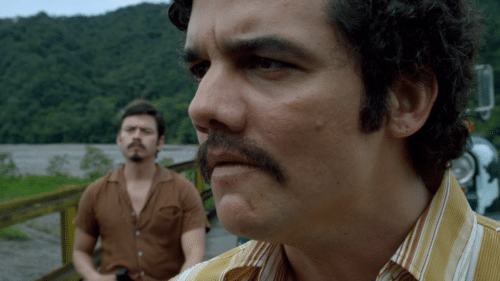 As the series is based in Colombia, it makes sense that you’ll be learning the Colombian dialect with “Narcos.” The language used in the show directly relates to the language used in Medellin and is foreign even to some native Spanish speakers. But as you watch you’ll find yourself understanding more and more as you become used to the unique turns of phrases and pronunciations of the show. In addition to the Colombian dialect, you’ll also be learning a large amount of parlache, which is a specific type of slang that’s traced to Medellin’s criminal population. Some phrases identified as parlache have slowly moved from the underworld into everyday conversations. However, it’s worth noting that not all of the vocabulary you learn will be suitable for every conversation. You wouldn’t want anyone to get offended by a particularly foul string of words! Specialized vocabulary. You’ll obviously learn a ton of vocabulary that’s associated with drugs and drug trafficking. Of course, you might not find yourself using these words on a daily basis (I hope) but they can be cool words to know among friends or just for fun. Swear words. You can’t expect drug lords to keep their language clean! These might also not be too useful, but let’s face it: swear words are memorable and fun to learn. Sentence structure. By paying careful attention to the spoken Spanish in the show, you’ll be learning common sentence structures and dialogue patterns. Politics and family life. These themes are covered extensively in the show, which means tons of exposure to related language. Culture and history. The events in the series are based on real people, historic events and locations, so you’ll be picking up a lot of information about the history of Colombia, albeit the more notorious side of it. Remember: No knowledge is superfluous! The more you know, the easier it’ll be to hold a fluent conversation. Don’t be afraid of learning new vocabulary that’s a little bit out of your comfort zone. Just to get you started, here are a few great lines from the show! Las mentiras son necesarias cuando la verdad es muy difícil de creer. The lies are necessary when the truth is very hard to believe. If you aren’t sure if you can use “Narcos” to learn Spanish, just look at Wagner Moura, the Brazilian actor who plays Pablo Escobar. The show was originally supposed to be filmed in English. A few months after getting the role, he found out that the producers wanted him to speak Spanish on screen. There was just one problem: he didn’t speak Spanish, just Portuguese and English. You might think that was the end of his part in the show, but it wasn’t. He moved to Medellin and learned Spanish from scratch. By the filming date, he was proficient in Spanish and able to play his part flawlessly. If Moura can learn Spanish and film a worldwide television series in a matter of months, then you can definitely learn something from Moura’s Spanish as he plays Escobar. 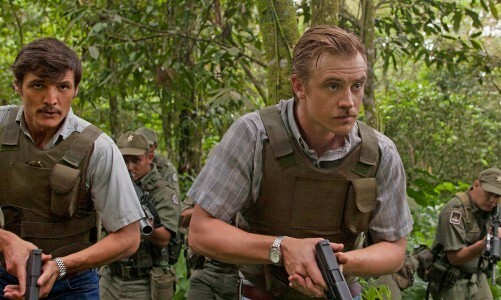 That said, here are six tips for learning Spanish from “Narcos”! There are two main ways to learn Spanish from TV shows and movies: active and passive learning. Active learning requires you to stop frequently and take notes on any words you don’t understand or phrases you like. Considering how many memorable phrases there are in “Narcos,” you’ll be taking plenty of notes! This approach is best for beginners, as it allows you to actively add vocabulary and expressions to your knowledge base. As you watch the show, you should take notes on vocabulary that stands out to you. If something is confusing, then just rewind the scene and give it another try. You can also repeat words and phrases aloud to help the language really sink in. Passive learning focuses on getting the sounds and rhythms of the language down, rather than individual words. More advanced learners should try using the passive approach to learning. Simply watch the show and pick up on things as they happen. How well can you understand what’s happening? Try not to rely on the subtitles (more on this later), and re-watch certain sections more than once. You’ll have to decide for yourself which approach works better for you. Just make sure you’re getting the most out of your learning experience! You probably automatically have the subtitles on when you watch. If you use the subtitles too heavily, you won’t be doing much learning. Watch the show with the subtitles off and see how much you can pick up. Then, turn the subtitles back on and check your understanding against them. Considering the slang-heavy nature of “Narcos,” you might find words being used in ways you didn’t expect. Write these down! If you’re having trouble picking up the Spanish dialogue, turn on the Spanish subtitles. This’ll give you the added benefit of seeing any English audio translated in real-time into Spanish, for an extra boost of learning! “Narcos” uses the Spanish language heavily throughout the series, but the show isn’t exclusively in Spanish. You can watch the entire series in Spanish, though, just by changing the audio language. Beginners might want to keep the English subtitles on with this option to help them understand the key points. But if you’re a more advanced learner, turn those subtitles off and watch the show in pure Spanish! Make particular note of how the translated parts compare to the parts originally in Spanish. Can you hear the difference in the way the language is used? Listen to these differences for a better understanding of how Spanish is really used in the real world (or, at least, in the world of the drug cartel!). Normally, we would recommend that you take things slowly when learning with TV shows. But “Narcos” is such an addictive show, you might find yourself binging an entire season in a day. And that’s okay! Take things at your own pace. If you do find yourself zooming through the show, though, keep a notebook nearby. Note down the season, episode and approximate time where you heard something you liked or didn’t understand in Spanish. Since you can do this in shorthand—for example, s1,e2,15:05—it won’t interrupt your flow, but it’ll give you a chance to come back to a particular spot and learn from it once you’ve satisfied your binging urges. Once the show was underway, Netflix realized it had great potential as a fun way to learn some Spanish. As a result, the company created an entire series of lessons surrounding the show’s language! You can watch the instructional videos in a playlist on YouTube, which features the show’s actors sharing key phrases from the series. The videos are fun and tongue-in-cheek and offer a playful take on the language of the show. Finally, everything is more fun with a friend! Watch “Narcos” together, then have fun reenacting key conversations. Make sure to include all the crazy lines and gestures as you go along! It’ll definitely make for an amusing night in. But, more importantly, you’ll be practicing Spanish conversation and pronunciation! If you’re watching TV at night anyway, you might as well use that time to learn Spanish. Practice your Spanish skills with “Narcos”!